How we provide equal educational opportunity to an increasingly diverse, highly urbanized student population is one of the central concerns facing our nation. 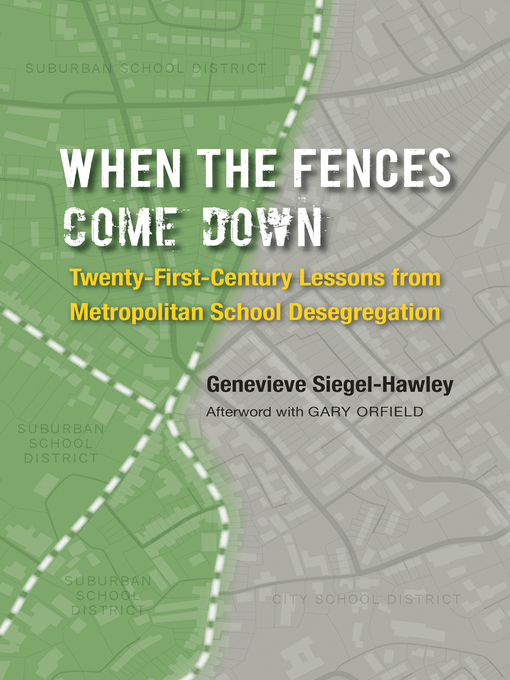 As Genevieve Siegel-Hawley argues in this thought-provoking book, within our metropolitan areas we are currently allowing a labyrinthine system of school-district boundaries to divide students—and opportunities—along racial and economic lines. Rather than confronting these realities, though, most contemporary educational policies focus on improving schools by raising academic standards, holding teachers and students accountable through test performance, and promoting private-sector competition. Siegel-Hawley takes us into the heart of the metropolitan South to explore what happens when communities instead focus squarely on overcoming the educational divide between city and suburb. Based on evidence from metropolitan school desegregation efforts in Richmond, Virginia; Louisville, Kentucky; Charlotte-Mecklenburg, North Carolina; and Chattanooga, Tennessee, between 1990 and 2010, Siegel-Hawley uses quantitative methods and innovative mapping tools both to underscore the damages wrought by school-district boundary lines and to raise awareness about communities that have sought to counteract them. She shows that city-suburban school desegregation policy is related to clear, measurable progress on both school and housing desegregation. Revisiting educational policies that in many cases were abruptly halted—or never begun—this book will spur an open conversation about the creation of the healthy, integrated schools and communities critical to our multiracial future.